Home » Art , Buenos Aires » Buenos Aires Street Art, discover the best murals in the city. Buenos Aires Street Art, discover the best murals in the city. Buenos Aires is renowned for its vibrant street art culture, with both Fodor's and the Huffington Post listing it as one of the top cities in the world to see urban art. Street art is highly valued and more socially acceptable than in many other cities, and laws are relatively relaxed, with artists usually only needing the permission of the property owner or residents' association to create their work. This has attracted big name street artists from far and wide, as well as helping local artists make a name for themselves. The Buenos Aires city government has commissioned several large-scale pieces itself. 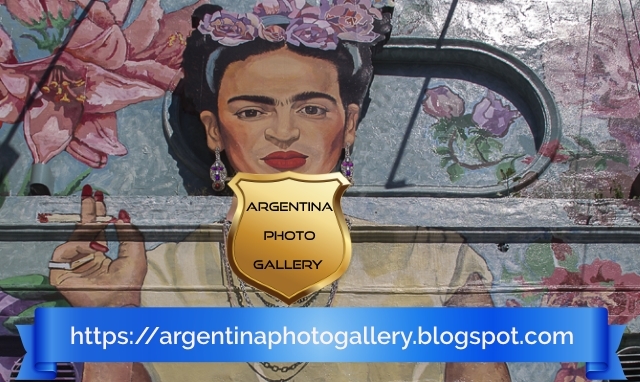 Campos Jesses' Frida Kahlo at the junction of Dorrego and Cabrera, Palermo neighbourhood. MACA paint mural in Villa 21-24 in Buenos Aires. The artwork of 370m2 in Villa 21-24 in Barracas took the 13 members of the Museo a Cielo Abierto (MACA) collective six weeks to complete with help from from neighbours from the area. The project was organised by Catalina Cabrera together with artistic coordinator Julian Zacariaz. This mural featuring a Maori with his tongue sticking out was completed by Niño de Cobre earlier this month in Palermo Hollywood, Buenos Aires. Niño de Cobre is an Argentine street artist from Santa Fe who specialises in painting realistic portraits. The face of the man is decorated with ‘ta moko’ or Maori tattoos that often contains ancestral tribal messages specific to the wearer. Maori mural by Niño de Cobre in Palermo. Soda Stereo mural by Kiki in Buenos Aires. Colombian street artist Kiki (real name Cris Herrera) finished a new mural in Chacarita, Buenos Aires dedicated to the Argentine rock band Soda Stereo a couple of weeks ago. The project was organised by BA Joven. Kiki told BA Street Art: “For me Soda Stereo are one of the benchmarks of music in Latin America when I was growing up and I was really excited by the idea of painting a tribute to the band. Alfredo Segatori paints trash mural in Palermo. Alfredo Segatori has completed a spectacular new mural in Palermo made of recycled materials at a new bar in Palermo. Exclusive photos by BA Street Art. The artwork featuring a portrait of an old man has been created out of recycled items such as a car parts, bicycle wheels,tyres, rusty cans, a computer, a telephone and scrap metal and was completed two weeks ago for the opening of Desarmadero Bar in Palermo Viejo. Owl mural by Paul Mericle in Buenos Aires. Paul Mericle was in Buenos Aires a few weeks ago and painted this stunning new mural of a Great-Horned owl in Coghlan. The project was organised by BA Street Art. Read also: Cueva de las Manos, a Cultural Heritage Unesco in Santa Cruz province. Baltimore street artist Paul Mericle was staying in Buenos Aires for the second time in four months and this is the second mural he’s created, this time featuring an owl that is indigenous to the Americas. New giant mural in Buenos Aires by Spear and Leticia Bonetti. Belgian muralist Spear together with Argentine street artist Leticia Bonetti completed a new mega mural in Buenos Aires on Sunday. Project was curated and organised by Buenos Aires Street Art. Photos of the process by Adri Godis for Buenos Aires Street Art. The artwork measuring 700m2 was organised and curated by Buenos Aires Street Art and took 18 days for the two street artists to complete. The amazing mural has already helped transform the area and bring a smile to many people who live and work in the zone of Saldias. Many thanks to the project sponsors Alba Pinturas, Kuwait Aerosol Urbano and Maquinarias Pyramiz for their fantastic support. Barrio Chino street art by Indigo Ars in Buenos Aires. Barrio Chino, located in the neighbourhood of Belgrano (centred around five blocks along Arribeños Street) is a tourist attraction and famous for its Chinese restaurants, food stalls, stores selling imported goods from China and local businesses offering Chinese medicine, massages and acupuncture. Over the last year, the Chinatown of Buenos Aires has also become well known for its street art. Beautiful murals in the streets of Buenos Aires. Excellent post I share in social networks. Greetings. Beautiful murals that rescue the street art of graffiti. Thanks for your comment. Greetings.